I'm hoping someone can help with this. Every now and then I will get on one of my PC's and a certain number of websites will fail to load. I get the ERR_CONNECTION_TIMED_OUT message. It seems random and it's not just PC or browser based b/c it will occur across multiple browsers and PCs. I'm thinking it has something to do with the network/firewall. I saw this behavior in pfSense also. It almost seems like if I wait and reload long enough most if not all the websites will start loading. Much more rarely a page will partially load. I've looked at the logs but since I don't know what I'm supposed to be looking for I didn't see anything that stood out as a possible culprit. EDIT: I do get DNS resolution to the websites and most do reply back to pings. Flushing the DNS on the PC's doesn't do anything and for whatever reasons rebooting OPNsense doesn't seem to help at all. BUT If I shut it down and leave it off for a few minutes and turn it back on the websites will either connect by themselves or after a few seconds on a refresh. High packet loss on your internet connection to your provider? I've experienced the same error in my network. In my case, there are many moments along the day with "microcuts". Usually a page fail to load showing that error, but few seconds later if I refresh everything works fine. ¿How can I test if is an ISP problem? Do you use the Gateway monitoring? @fabian I keep an active PING to the 20 sites that I typically have open at any given time (since I can never be sure which one will drop out). when the outages happen I don't see any packet loss (to any of the sites that are down). DNS resolves fine but the sites are not reachable by ping. @Animostiy022 I wasn't even aware that there was a Gateway monitoring. I have looked at the gateway status during the outages and it is up. The old thing is that the last time this happened I had turned off UPnP and restarted OPNsense, buthat could just be a coincidence. Turning it back on and rebooting the firewall did not help but once I shut it down for a bit everything was back up. I'm going to test this tonight after the girls are sleeping to see if i can replicate. I looked at the logs but I really didn't see anything. Is there some logging or anything that I can turn on or use that can help pinpoint this issue if i can replicate it? this is probably hard to find but the only thing that may help is a packet capture when this happens. Just for sanity, I'd remove all those extra DNS items unless you need them. You can turn off the ISP and such, mine looks like this just for using OpenDNS. 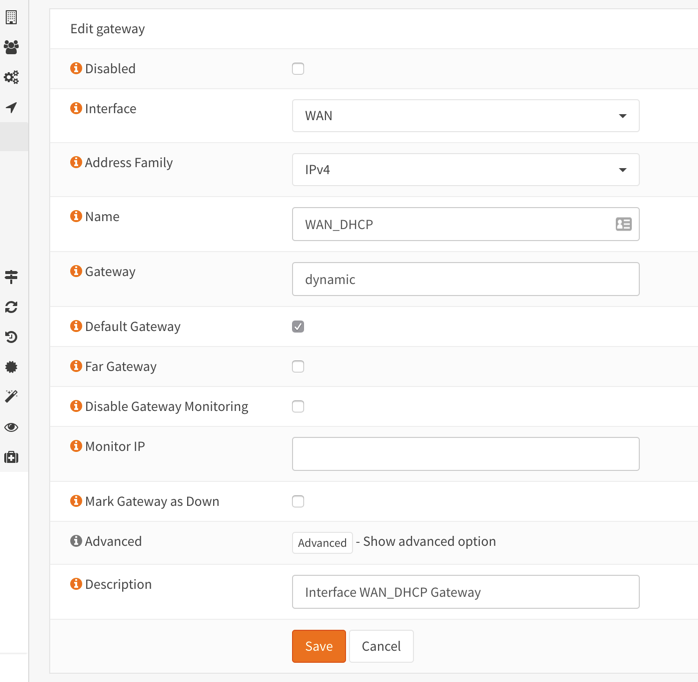 For Gateway monitoring, hit Gateways->All and on the right side there is a box for edit. I had mine disabled for some reason and just turned it back on. I'm going to buy you guys a beer or two. Did as you recommended, I only put in that many DNS servers since I thought it would query them all and select the fastest one. I have the Gateway being monitored now. I did notice that if you have three columns and have the DynDNS widget up the IP's stick out past the "box" on the right. I've been running with 2 for quite some time. If you wanted to add another provider, I wouldn't see a problem with that. If you are using OpenDNS for content filtering and blocking, I'd leave the 2 (That's my setup). Well, I can say is solved for me. My problem was related with ISP cheap router and double NAT. 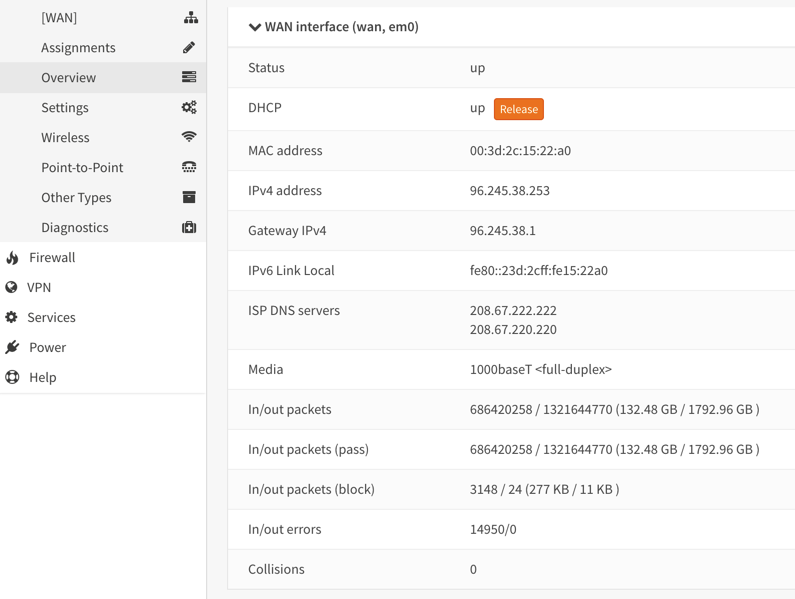 I removed the ISP router and connected directly with PPPoE and now everythings works fine. I ran into a double NAT issue a while ago but that's not my issue. I haven't had a chance to do some testing on this but for now it's working. I did move off of PIA and onto AirVPN and so far it doesn't seem to mess around with my network like PIA would sometimes do.